Dylan Moran at the launch of the Clash Of The Titans, which takes place at the National Stadium, Dublin on Saturday night. Photo: Inpho. Kilmacthomas welterweight Dylan Moran [9-0, 5 KOs] got what most young boxers dream of last month as he secured a big three-year promotional deal with major American outfit Star Boxing and looks set to feature on big fight cards on the U.S. East Coast alongside Irish legend Katie Taylor. 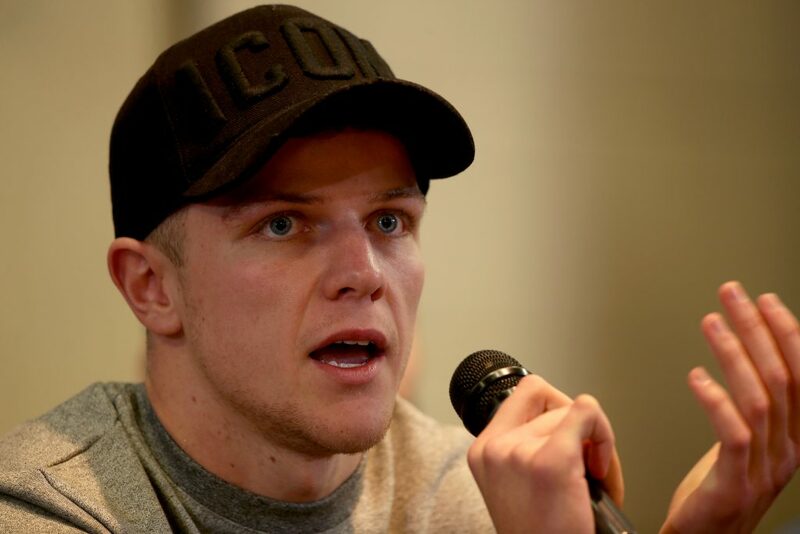 However, Moran remains a home-bird and plans to fight regularly in Ireland on top of his new deal – starting this Saturday night, March 30th. Here, in Dublin’s National Stadium, ‘The Real Deal’ will make a step-up and face Hungary’s former EU champion Gyorgy Mizsei Jr over eight rounds LIVE on TG4 on the game-changing Assassin Promotions and Boxing Ireland Promotions ‘Clash of the Titans’ card. He previously fought on the Assassin Boxing Presents – The Homecoming, card at The Royal Theatre, Castlebar, Co. Mayo in December. “I was surprised at it coming so soon. Kaz [Evans, manager] rang me and just said I have some amazing news for you. When he told me it took me a while to believe him. I always knew I had to work myself into a position to get an offer like this and I’m here now. These guys come along and have taken all the worries and stresses of selling tickets and that away and they’ve given me the big stage to perform on and that’s all I need. No doubt the hard work starts now and I now know, if I continue to dedicate myself, the opportunities are there for me and I will prove I am one of the best in the world,” added the former St Paul’s amateur. ‘Clash of the Titans’ is packed with all-Irish fights, with Victor Rabei and Jake Hanney boxing for the Irish light welterweight title in the chief support. Beyond this, there are further domestic dust-ups between lightweights Martin Quinn and Francy Luzoho, a pair of super featherweight bouts with Allan Phelan taking on Aiden Metcalfe and Kelvin McDonald facing Declan Kenna, and two light middleweights fights with Graham McCormack boxing Jade Karam and Cillian Readon clashing with Jordan Latimer. The undercard also features appearances for Dylan’s fellow Waterford fighter, super middleweight Craig McCarthy, Poleglass lightweight James Tennyson, Killarney super feather Siobhan O’Leary, Swords heavyweight Paddy Nevin and debuts for Kerry’s Kevin Cronin and Kildare’s Katelynn Phelan. Tickets for the night cost €40 (general), €60 (ringside), and (€100 VIP) and are available from Ticketmaster.ie or Universe.com or by contacting Dylan Moran directly through his social media or at 087 170 3727. The fight is also live on TG4.